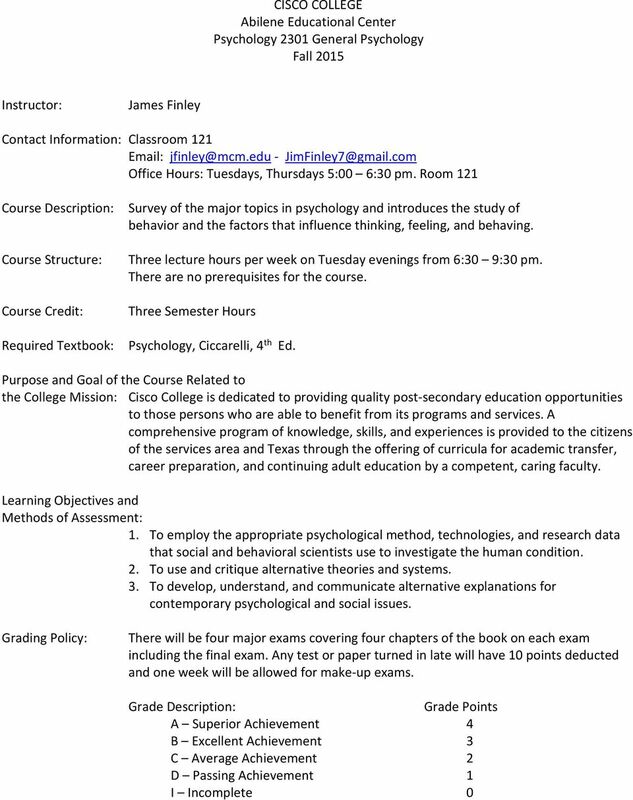 Download "CISCO COLLEGE Abilene Educational Center Psychology 2301 General Psychology Fall 2015"
2 F Failure 0 W Official Withdrawal 0 Attendance Policy: Prompt and regular class attendance is considered necessary for satisfactory work. Cisco College recognizes that absence from class may occur due to illness, death, or illness in the immediate family, observance of a religious holiday, military duty or participation in a college-sponsored activity. (Absences due to participation in a college-sponsored activity must be authorized by the Vice President of Instructional Services.) Any student missing a class due to any of the above has two weeks to make up the work missed. For this class, any student missing more than two times must be dropped from the class and given a failing grade for non-attendance. Make Up Exams Overdue Assignments: Make up exams are not given except under very extenuating circumstances. If you miss an examination, you are at risk of failing this class. Project papers or other assignments turned in after the deadline will automatically be lowered one grade level (e.g. A will become a B). In some instances, papers may not be accepted after the due date. 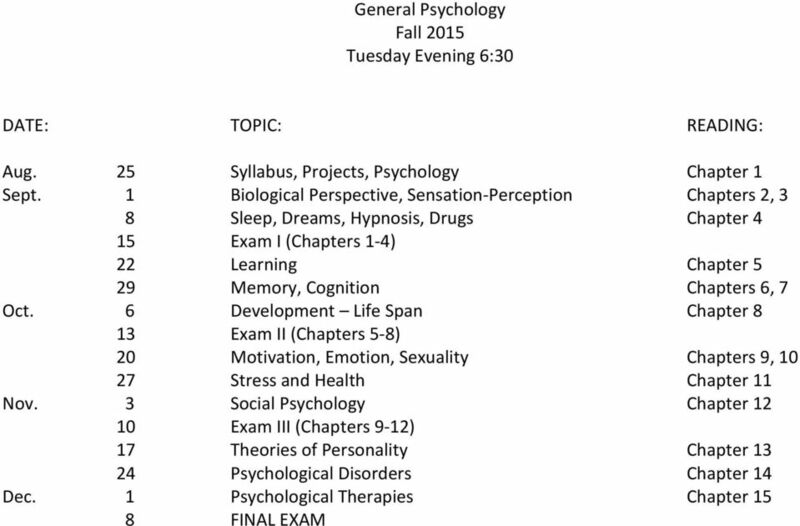 Class Requirements and Assignments: There will be two written assignments and four major examinations to complete for this class. Please see the instructions for the assignments and projects listed below. 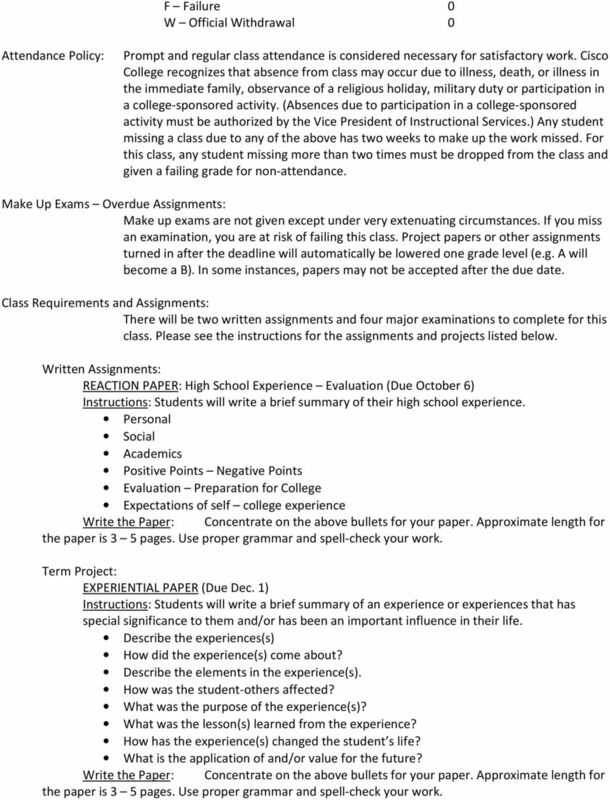 Written Assignments: REACTION PAPER: High School Experience Evaluation (Due October 6) Instructions: Students will write a brief summary of their high school experience. Personal Social Academics Positive Points Negative Points Evaluation Preparation for College Expectations of self college experience Write the Paper: Concentrate on the above bullets for your paper. Approximate length for the paper is 3 5 pages. Use proper grammar and spell-check your work. Term Project: EXPERIENTIAL PAPER (Due Dec. 1) Instructions: Students will write a brief summary of an experience or experiences that has special significance to them and/or has been an important influence in their life. Describe the experiences(s) How did the experience(s) come about? Describe the elements in the experience(s). How was the student-others affected? What was the purpose of the experience(s)? What was the lesson(s) learned from the experience? How has the experience(s) changed the student s life? What is the application of and/or value for the future? Write the Paper: Concentrate on the above bullets for your paper. Approximate length for the paper is 3 5 pages. Use proper grammar and spell-check your work. 3 GRADING CRITERIA FOR TERM PROJECT: The following criteria will be used in grading the writing assignments: Content: did the paper contain the information asked for by the instructor and was it coherent and consistent? Grammar and spelling: The document reads smoothly, has good transitions, and is free of grammatical and spelling errors. Deadlines: did the student meet the deadlines for the final paper? 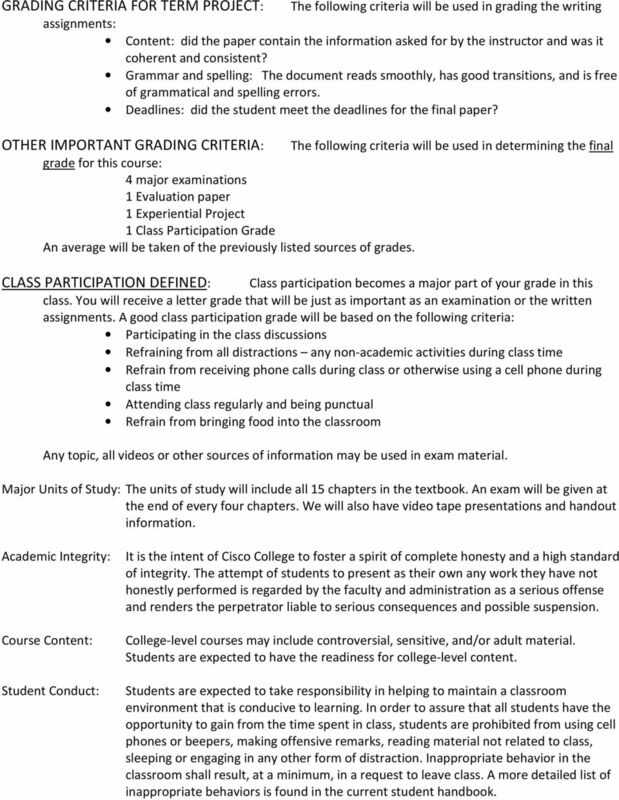 OTHER IMPORTANT GRADING CRITERIA: The following criteria will be used in determining the final grade for this course: 4 major examinations 1 Evaluation paper 1 Experiential Project 1 Class Participation Grade An average will be taken of the previously listed sources of grades. CLASS PARTICIPATION DEFINED: Class participation becomes a major part of your grade in this class. You will receive a letter grade that will be just as important as an examination or the written assignments. A good class participation grade will be based on the following criteria: Participating in the class discussions Refraining from all distractions any non-academic activities during class time Refrain from receiving phone calls during class or otherwise using a cell phone during class time Attending class regularly and being punctual Refrain from bringing food into the classroom Any topic, all videos or other sources of information may be used in exam material. Major Units of Study: The units of study will include all 15 chapters in the textbook. An exam will be given at the end of every four chapters. We will also have video tape presentations and handout information. Academic Integrity: It is the intent of Cisco College to foster a spirit of complete honesty and a high standard of integrity. The attempt of students to present as their own any work they have not honestly performed is regarded by the faculty and administration as a serious offense and renders the perpetrator liable to serious consequences and possible suspension. Course Content: Student Conduct: College-level courses may include controversial, sensitive, and/or adult material. Students are expected to have the readiness for college-level content. Students are expected to take responsibility in helping to maintain a classroom environment that is conducive to learning. In order to assure that all students have the opportunity to gain from the time spent in class, students are prohibited from using cell phones or beepers, making offensive remarks, reading material not related to class, sleeping or engaging in any other form of distraction. Inappropriate behavior in the classroom shall result, at a minimum, in a request to leave class. A more detailed list of inappropriate behaviors is found in the current student handbook. 4 Student Technology Use in Classroom Policy: Students should silence all communication devices, which include but are not limited to phones, pagers, recorders, palm devices, and laptops. No communication devices should be visible on desks during class unless otherwise directed by the instructor as part of a class activity or approved by the instructor for note taking. An exception to this policy may occur due to college-wide emergency notification. If a pressing situation requires communication during class, notify the instructor before class begins, sit near the door and quietly exit the classroom before answering any communication. 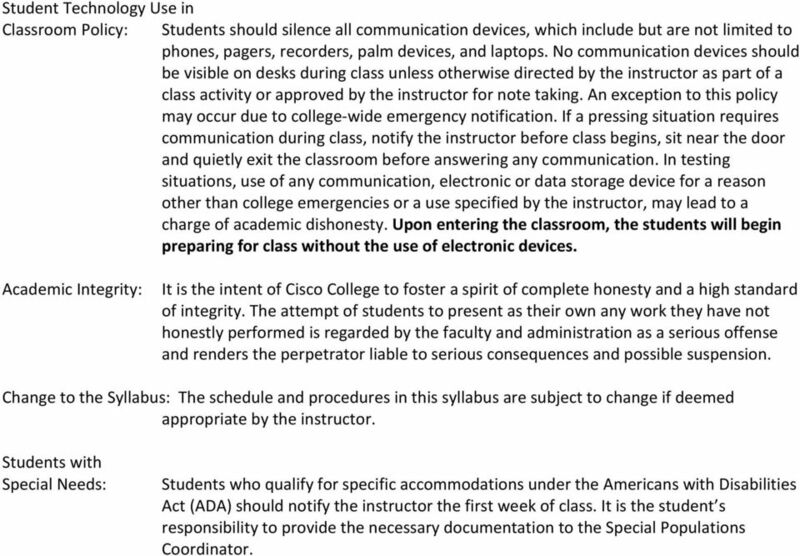 In testing situations, use of any communication, electronic or data storage device for a reason other than college emergencies or a use specified by the instructor, may lead to a charge of academic dishonesty. Upon entering the classroom, the students will begin preparing for class without the use of electronic devices. Academic Integrity: It is the intent of Cisco College to foster a spirit of complete honesty and a high standard of integrity. The attempt of students to present as their own any work they have not honestly performed is regarded by the faculty and administration as a serious offense and renders the perpetrator liable to serious consequences and possible suspension. Change to the Syllabus: The schedule and procedures in this syllabus are subject to change if deemed appropriate by the instructor. Students with Special Needs: Students who qualify for specific accommodations under the Americans with Disabilities Act (ADA) should notify the instructor the first week of class. It is the student s responsibility to provide the necessary documentation to the Special Populations Coordinator. 1. Strengthen your knowledge of the biological principals governing the nervous system. UNIVERSITY OF LA VERNE COLLEGE OF LAW NEGOTIATION DAY CLASS CRN 1250 Spring 2015 Syllabus PROFESSOR: Susan Nauss Exon CREDIT HOURS: Two Credit Hours DAYS & TIMES: Tuesdays, 9:30 11:30 a.m. ROOM: 206 I.